From Square Enix. The FRONT MISSION Series tells a science fiction story revolving around the worldwide conflicts that plague the near future. This time, the spotlight shines on Zenith Arid Camo Variant, from the popular FRONT MISSION 1ST series. In addition to its elaborate mechanical form, this figure's specialized joints allow it to realize a high degree of mobility and action. In addition, the weapons and backpack included with this figure can be used interchangeably with other WANDER ARTS series wanzers, allowing for high customizability. This wanzer's armor features a monochromatic color palette, perfect for camouflaging itself in desert environments to maximize its effectiveness in this particular field. 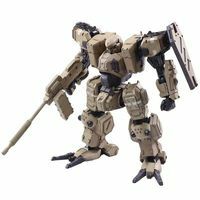 Additionally, the figure features faithful recreations of the wanzer's appearance, including the armor's texture and the metal-like quality of its frame, and provide a realistic portrayal of the wanzer as a military weapon. Figure stands about 4.5" tall and includes display stand. Legal Notice: Entire contents trademarked (® or TM) and copyrighted (©) 1986-2019 by Things From Another World, Inc. and respective copyright and trademark holders. All rights reserved. Page rendered at 2019-04-19 01:34:30 in 0.305 seconds.